At the end of November last year, I wrote an article on my top 5 stock picks for 2017. My picks were based on good companies that had been quite oversold and whose valuations were looking good at the time. The entire portfolio is up 9.4% over the period, while the JSE All share and JSE Top 40 is trading 6.95% and 7.84% higher respectively. 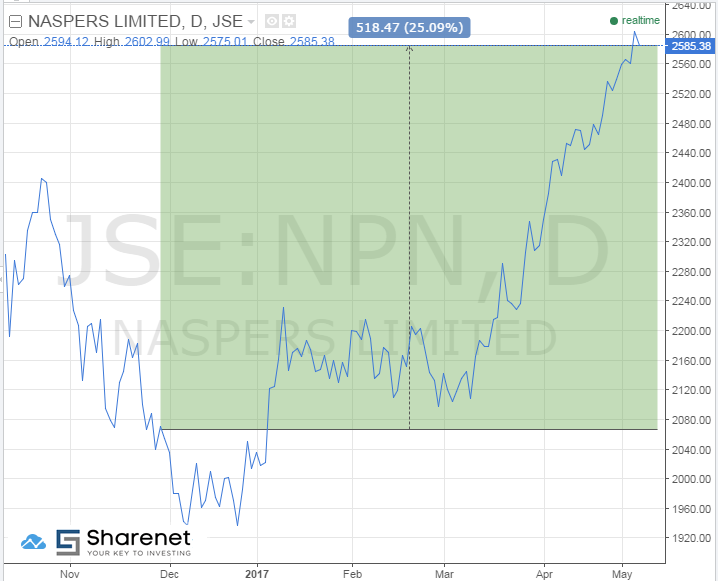 Naspers was the best performer over the period, gaining a staggering 25%. Naspers recently announced that they will increase their stake in Takealot with R1 billion; they did not disclose how big the stake is, but they already own about 40% in the company. Tencent, which Naspers has a 33% stake in, has reached new highs and has gained 30% year-to-date. Tencent recently announced that they have bought a 5% stake in Tesla, the electric car company that was founded by South African born entrepreneur and inventor Elon Musk. Naspers is my favourite pick of the five companies, and I believe it will continue to do well with its broader strategy of investing in internet firms looking to disrupt industries. 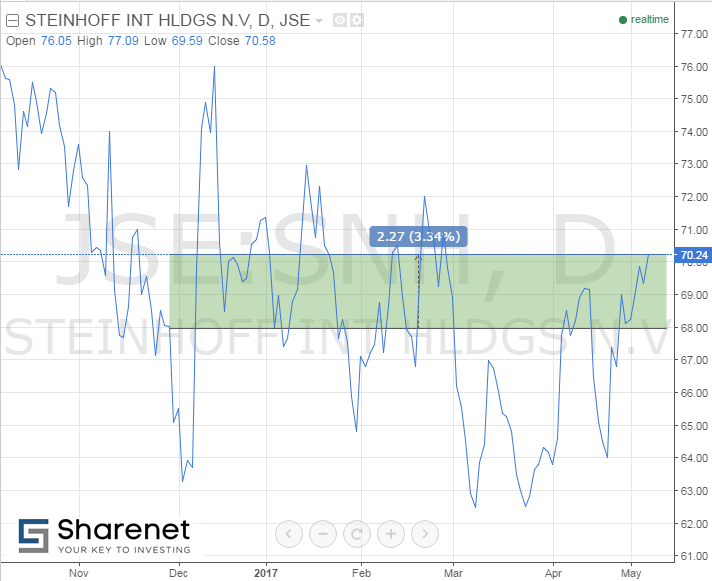 Steinhoff was one of my favourite picks at the end of last year, but the share price has not done as well as I would have liked. Steinhoff has gained 3.5% over the period, which I think is way underdone and is looking even more attractive than in the past. We found out on Sunday night that Emmanuel Macron won the French election, which has boosted confidence in the euro zone and is positive for the retail business in Europe, where Steinhoff has a substantial footprint. Investors are still waiting to see how Steinhoff’s most recent investment in the US, Mattress Firm, will form part of the company’s broader synergies. Its dividend yield of 3.13% is attractive for a growth company. I will keep their stock in my long-term investment portfolio for the foreseeable future, as it is still a great buy at current trading levels. 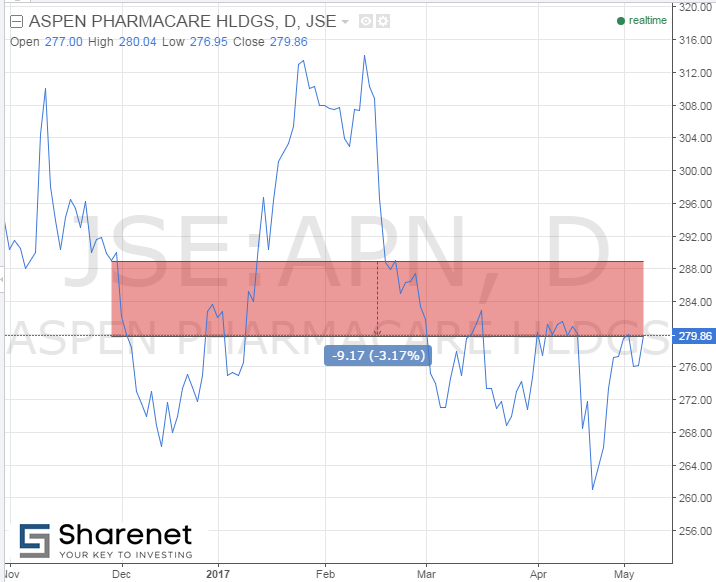 Aspen is the only company from my Top 5 Stock Picks of 2017 that is trading lower; it is down just over 3% for the period. Aspen took a reputational knock recently about their pricing practices in the UK after they increased the prices of four life-saving cancer drugs. Regulators and the media are taking a strong stance against pharmaceutical companies that try to push up the prices of their medicines, especially in the generic market, when the company does not have to incur costs of research and development. The recent blow to the company’s share price has recovered to around R280 at the moment, and I suggest holding the stock for the longer term. 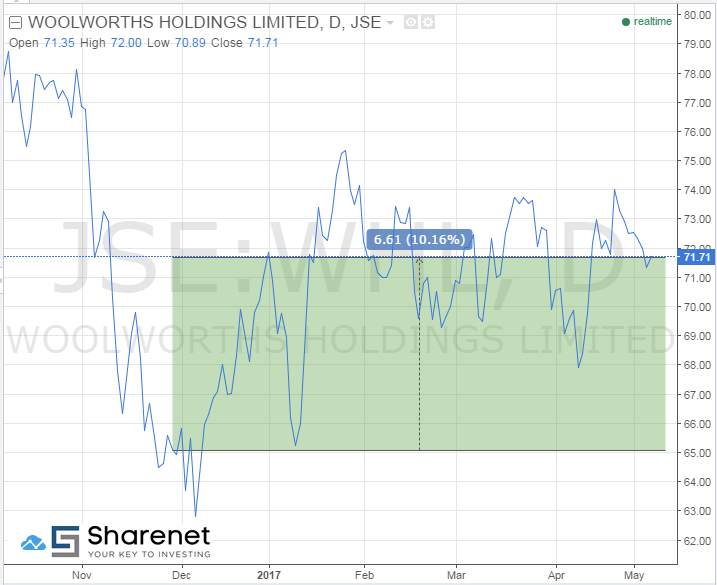 Woolies have been getting into exciting stuff in the past couple of months and the share price has gained just over 10% in the period. It is my favourite company in the South African retail space, and I am backing it to deliver on investor returns in the foreseeable future. Woolies has launched their healthy fast food restaurants called "Now Now" and it seems that the consumers are enjoying the forward-thinking app that is used as an order and payment method. The retailer has also announced that they will start selling high-end cosmetics, which is a highly profitable market to go into. The company is backing itself to double its market share of beauty products in the next three years. I suggest a buy at current trading levels of around R70 a share and a PE ratio of 16.26, while the dividend yield is very attractive at 4.33%. 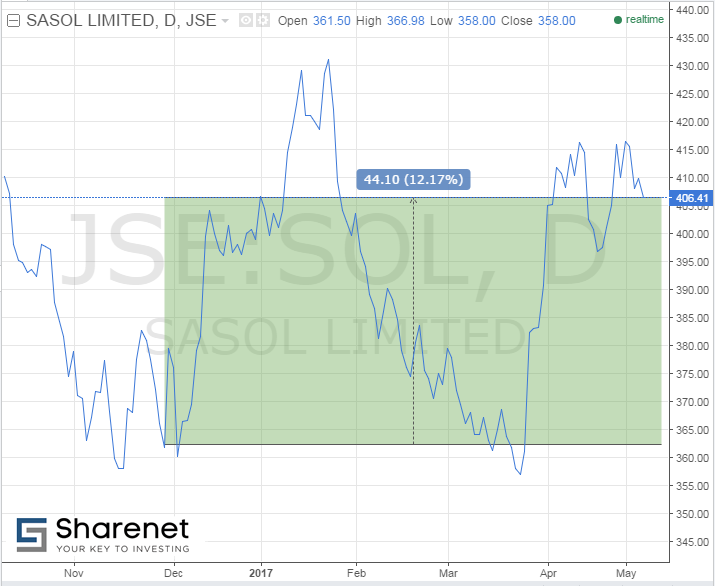 Sasol have had a good run in the past couple of months and is trading over 12% higher for the period. The bullish sentiment around oil prices has changed and there are a couple of analysts who believe the price will go down to $40 per barrel. The longer-term view on Sasol is that fossil fuels will continue to feel pressure from the increasing global uptake of renewable energy like solar and wind power. All in all, I am happy with how the portfolio has outperformed the market in the past couple of months, and I believe it will continue to do so in the foreseeable future. The political risks have been getting higher since the end of last year, so I am happy that the portfolio has Rand-hedging characteristics. I believe the local market will continue to come under pressure from a political standpoint, so the fact that my top five companies have most of their interest in foreign assets is beneficial for the longer-term growth of the portfolio.